I've been mulling over an idea for a week or so. I'm thinking of starting up a "support group" for all of us who are attempting to sew from the stash this year. Nothing too big, just a link-up party once of month with all those great stash busting projects. No competition, just enjoying using all those fabrics we already have on hand that we've all been hording saving for a rainy day. I've seen so many bloggers mention the desire to use the stash this year. I'm considering name ideas for our little group. Any suggestions? For all of you who participated in any of the color wheel swaps, I hope you are using them. I'd love to feature your projects. I know lots of you are debating exactly what to do with that stack of colorful greatness. It's always fun to see what others are up to. I have cut all of mine into 2.5" squares. This is my progress so far. 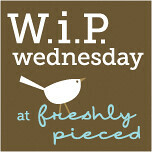 I'll be sharing more of my design process as I get a few more colors up on the design wall. For those who haven't had a chance to participate in a swap, I'll be hosting another one in a couple months. 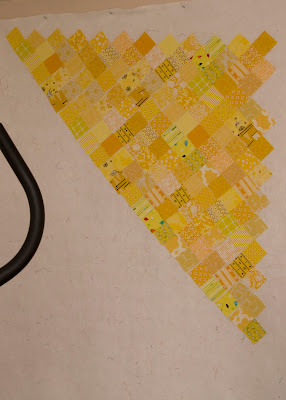 This guy was up on the design wall for a week or so, but came down so I could start working on my color quilt. I'll pull it out one of these days and sew all those blocks together. I'm really loving this different design for the strings blocks. My first try with Thangles. This project is just for fun. I'm still not sure what it will become. I just wanted to give them a try. Finally, not a sewing project, but I wanted to share a picture of a super cute Christmas present I received from my sweet aunt. 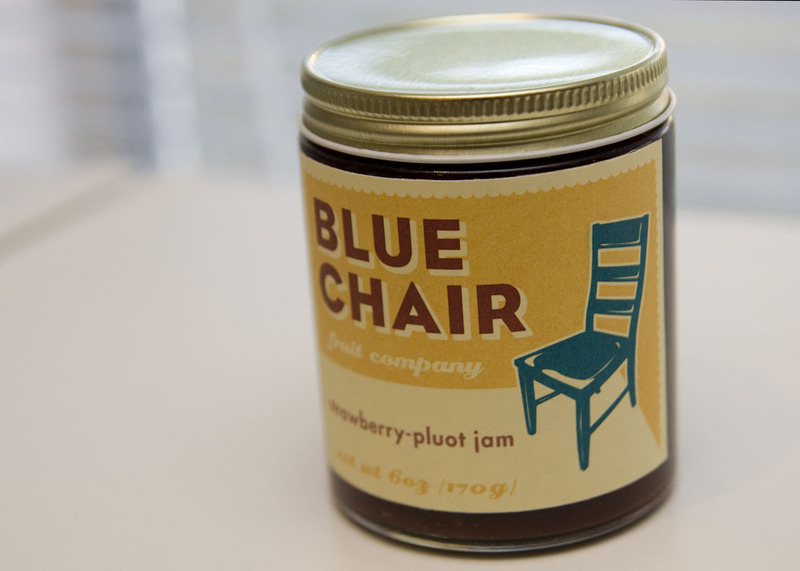 I haven't opened it yet, but I'm sure the jam is amazing. I'll have to carefully scoop it out and wash the jar so I can use it to store something sewing related. I love it! That's a great gift and WOW thos string blocks look amazing! I love the idea of a stash busters support group - sign me up! 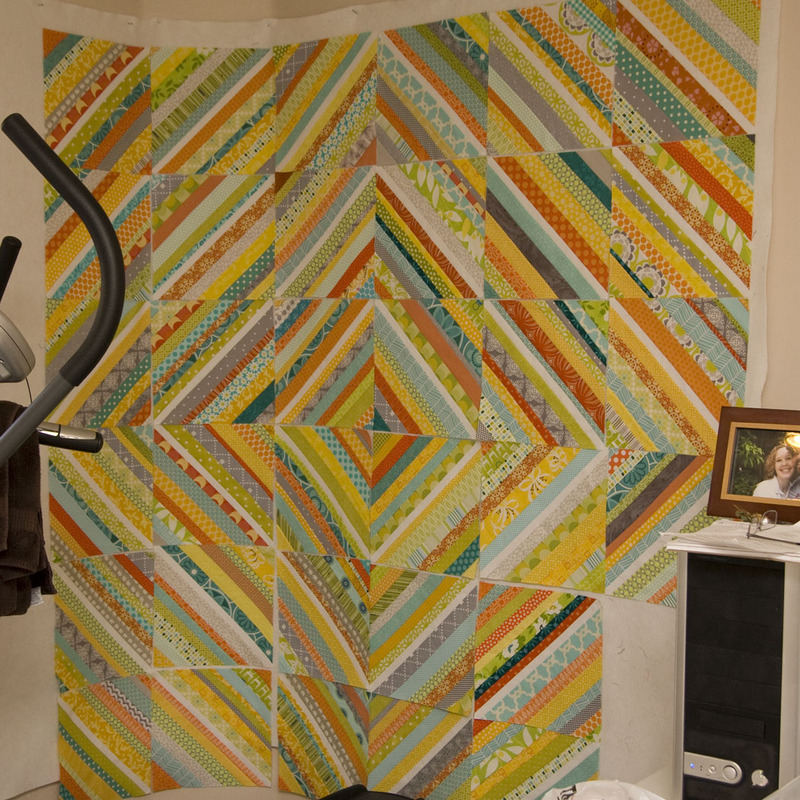 Your quilts on the design wall are amazing. I love your string block layout! I love the idea of a stash users group. Maybe call it the Reformed Fabric Hoarders - haha! Can't wait to see more of what you do with your charms. I just started using mine. I'm kind of winging it as I go. That string quilt looks amazing. And that jar is TOO cute! such a great idea about a stash busting group!! I don't have any creative name suggestions, but I've said more than once this year that I'm going to try and finish WIPS and only make stuff from my stash. Of course I'll still buy some fabric if it's on a great sale, but I aim to have all my quilts made this year from fabrics I already have. We'll see how that actually goes...but I do need to cut this stash down!! Yes, I have colorful charms I don't know what to do with! Stash Busters sounds good to me! I can't wait to see what you do with your color wheel squares! I have been using mine bit by bit in different projects, esp for swaps. It has been really handy to have small pieces of many colors in the 4x5 bee. I really love the string quilt....a lot of work. The string block quilt looks amazing. I also love all those small yellow squares, and the idea of Stash Buster Group? AWESOME!!! your string blocks made me stop in my tracks!! it's gorgeous. i pinned it! i got your string blocks done! eek I see 2 that are missing must be mine. Slash the Stash is the only thing that I can come up with; I like Stash Busters too. Great work, I love your yellow squares, I am interested to see what that turns into. I'm on my way to Google Thangles right now! Your string quilt is amazing! I can't wait to see if finished. I really love the strings. Did you like the Thangles? I am torn about the stash, but I am going work more from it as well. My goal is to stop buying novelty fabrics and more blenders. What a great little jar for you! I'm semi-on-board with the stash thing. I probably need a lot of support. My goal this year is to actually makes the quilts that I bought fabric specifically for, but not to beat myself up if there is a fabric that I really want to buy. I'm just going to do what makes me happy. Isn't that what quilting is all about? I love the small yellow squares! What a great idea! 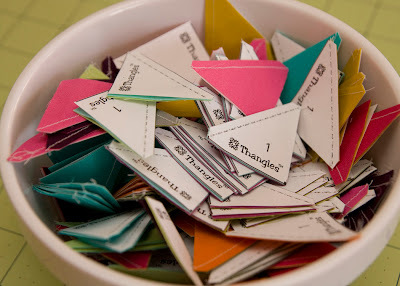 Great idea for a stash therapy group! Name ideas: Stash Attack or Bash the Stash, the Stash Reducer Gals, Destashers Anonymous (bit like AA but teetotal). I could go on but I won't!! I'll be waiting eagerly for the next charm swap! Great idea, I'm up for anything that reminds me I said I was going to use more than I buy! I love your charm square swap yellows up on your design wall, I can't wait to see what you're cooking up there! How are you liking Thangles? I treated myself to some for my birthday and haven't tried them out yet. What a thoughtful gift from your aunt!! Lucky you! Love where those charms are headed. I was thinking I might do stacked coins with mine, but then that may be a bit boring. Hmm. I've got another round I've signed up for here, so I'm hoping I'll have a huge variety of options soon! Loving your strings and jam too, how fab! Wow, that string quilt is going to be so cool! I'm in need of color wheel charm ideas too, so I'm interested to see what you come up with! Thangles! Your thangles look so cute! What size are they? I'm loving that someone found Blue Chair jam for you - how adorable!! I love the idea of a Stash User-Upper Support Group!! Your string quilt looks fab. Those string blocks are fabulous all laid out like that! So pretty! 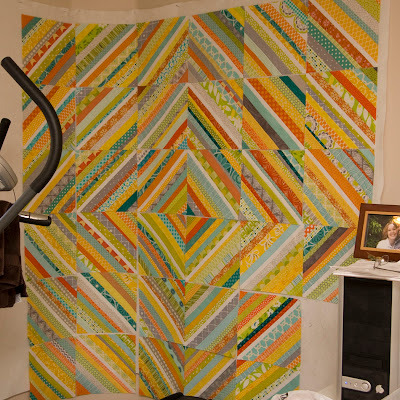 the quilt on your design wall is amazing! can't wait to see it when it's finished. That string quilt is ah.maz.ing! Holy cow!! I can't wait to see more of your charm swap quilt. I made mine into a quilt for my 4-year-old, I posted a pic to the flickr group. I didn't use all of mine, but many of them. He had fun going through them and picking his favorites to put in the middle of the star. I can't wait to do another swap with you! Love the string quilt. What a cool gift from your aunt. I love all the yellows, but I really love the string quilt! Amazing! What did you use as a foundation to sew onto? Thanks for sharing!